Budgeting has been a subject I've wondered for a long time. I do understand how budgeting works, but I've never really understood why it is there. Implementing Beyond Budgeting by Bjarte Bogsnes didn't explain to me why budgeting should be done, but it told, why it shouldn't be done. This is essential book for any modern organization. Traditional budgeting will slowly fade away and there will come new ways to lead companies and handle costs. Bjarte says that he might be too hard on some aspects of traditional budgeting and make some things too black and white. I didn't really feel like so. I believe budgets make so much harm in organizations, that Bjarte could have been even more strict on the effects of those. This book isn't a how to do Beyond Budgeting guide, but a story about the underlying principles and two journeys towards the ideology. Stories and ideas will give a good guidance how to start implementation, but there is definitely lot of thinking needed. What I love in the book is that tells realistically about the change. Implementing change needs lots of discussions, persuasion and time. Creating a new process or guidelines doesn't really change anything. The mindset behind actions needs to change. Bjarte tells about two organizations that have been on this journey. He admits that other journey was still ongoing as the book was written. The change started many years before, but it was still continuing. I highly recommend this book to everyone interested on improving the companies they are working at. This topic needs much more attention. There are some valid reasons behind budgets, but most of the reasons are just barriers for creating value to customers or constrains making people unhappy at work or pure waste. 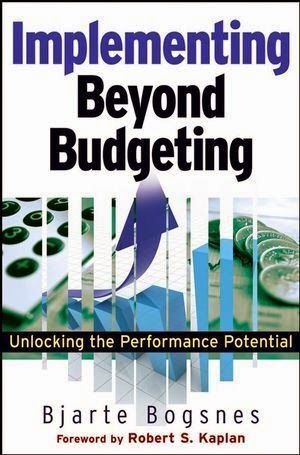 Changing traditional budgeting is important topic and this book was a good peek to the topic.